Thank you to everyone who donated to our campaign! Mission: To engage and enrich the community through visual arts appreciation, education and exhibition. Quest Art School + Gallery is the region's premier public gallery, contributing to the economic, social and cultural health of our community. Quest Art School + Gallery was built by community volunteers and remains a volunteer-driven organization with minimal staff. We offer high-quality visual arts programs for children, teens, adults and seniors for both emerging and established artists. As a proud tenant of the Midland Cultural Centre, Quest Art occupies two classroom studios and a volunteer-staffed art shop. Quest Art also programs a community gallery, a members' gallery and presents exhibitions in our Upper Gallery for which professional fees are paid. 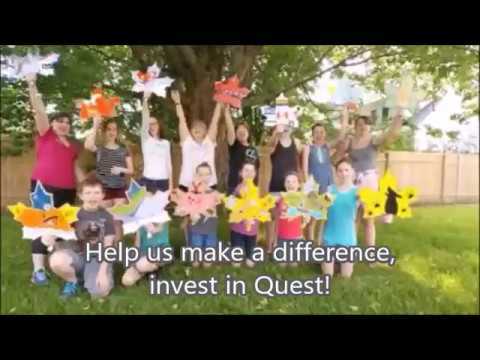 Within our 21 year history, Quest Art has developed a strong reputation that has led to beneficial partnerships and valuable outreach programs within the community. Throughout our existence we have ensured that our programs and exhibitions remain accessible to all through free admission to galleries and subsidized classes and workshops. To this point Quest Art has been able to grow its programming thanks to membership fees, workshop fees, donations, sponsorships, fundraising events, and project grants. With our enhanced position in the cultural sector, Quest Art is now serving local, provincial and national audiences. "What I love about art is that everyone does something different and it's a big blob of imagination"
"I thought this program was excellent. It was interesting, challenging, creative, great teaching and exciting. Lots of fun!" "Wonderful art and beautiful gallery."